What does “navigating complexity” look like? For the last 20 years my specialism has been to work in situations that are often conflicted (sometimes high levels of disagreement and blame), with significant issues of either unrealised potential or underperformance, complexity, and often a feeling of stuckness or hopelessness amongst those involved. VUCA (Volatile, Uncertain, Complex, Ambiguous) is a term growing in popularity to describe the conditions prevailing in many organisations and wider society. I’ve wondered of late whether the letter ‘V’ in VUCA could also be for Violent, to describe the frequent aggression, violence of language and tone, rapid polarisation, dismissal and denigration of the ‘Other’, that occurs in many situations. What can you usefully do in such situations? How do you best proceed? What are the predictable potholes that many people fall into, unwittingly and painfully? Our first response is often to draw on tools that are known to us and acceptable to our organisations. It’s only when the difficulty continues, when the pain intensifies and we know that we are at a dead-end, and where we care enough about the situation, that we begin to look for new ways forward. The good news is that this isn’t personal. You’re discovering a universal truth that there are no blueprint, ‘paint by number’, off-the-shelf, toolkit solutions for VUCA situations. What I’ve discovered, slowly over the years, are a set of navigation skills and a way of reading the landscape (my own inner world and the outer landscape of people, groups and organisations) that assist in finding a way through the challenging VUCA terrain in which we find ourselves. Slowly, I have learnt to accept uncertainty, confusion, fear, anger, blame and complexity as the predictable weather conditions one initially finds in such terrain. So what are the essentials for navigation in conflicted, seemingly stuck and complex situations? What do you need to bring with you? This work of letting go of things we no longer need – old behaviour patterns that no longer serve us, superfluous tools, hardwired ways of thinking that are less and less useful – is a big shift. This change in us is not like a one-off spring clean of the attic where we toss out old gear. If only it were so simple! Rather this shift in our internal navigation system (action logic is the technical term) is more like an evolutionary leap forward in our way of being and acting in the world. This may sound ethereal but in fact it’s absolutely critical. This shift is something we live our way into through experience, not something we think our way into. So in the middle of a messy situation, where do you start? 1. Remember the most important elements you bring to the situation are intangible. Many of us have been schooled to think about organisations in very concrete terms (strategy, value statements, plans, processes etc.) and these are important elements. And yet, how we are individually, an element to which many of us give insufficient attention, is the one factor over which we have (potentially) most control. Wherever we are in this system (Top, Middle, Bottom, Customer, External Consultant…) understanding the power and contagious impact of how we are – how we show up – is critical: the quality of our attention (or degree of distraction) our presence (or absence), our attitude (curious? judgmental? ), our compassion and capacity to understand and empathise with others’ worlds (and our self-awareness of what stuff triggers reflexive, dysfunctional responses). 2. Wake up to the reality that you are contagious. To test this, think for a moment about a person who has made a huge positive impact on you, even through a very short encounter. I am confident there was something about how that person was, that intangible quality we sometimes refer to as their state of being, that contributed to that positive experience. Now back to your organisation and its challenging situation, William O’Brien, former CEO of Hanover Insurance, drew this lesson from his experience of leading change over many decades: “The success of an intervention depends on the interior condition of the intervenor.” This isn’t an injunction to be a super-human leader or consultant but it is a recognition that the habits and qualities we cultivate impact others in ways we may not account for. We are contagious, for good or ill.
3. Consider who you should engage. Who can? (Who has formal authority? Who has key influence?). 4. Create the necessary starting conditions. Generating an agreement and a willingness to explore is the first step. Ask what the minimum conditions are that need to be present, in order for the different parties to join and come along. This is a subtle process: it’s not just asking, but listening beyond and between the words, for what wants and needs to be said but can’t easily be articulated yet. 5. Decide whether this is a battle of messages or a space for you to learn and move forward. Am I willing to sense and feel the emotional tone, texture, rawness of feeling(s) and needs of the other party, a process that can be highly uncomfortable? Am I willing to entertain a more complex reality than the version of events that I hold as the ‘truth’, where I see myself as the innocent, the one with noble, pure intentions? How wedded am I to the idea that I am the victim or unrecognised hero? The story of a conflict is rarely as simple as we paint. There are many stories experienced from different vantage points. Motivations including our own are often mixed and more complex than they first seem. Interpretations are often drawn based on mis-reading the intentions of other parties, and actions have been taken based on these mis-interpretations. Do we want to be right and victorious, or is it more important to restore partnership? Vengeance is a powerful force, not to be underestimated, and often dresses itself up in more rational clothes, cloaking the desire to vanquish the other, under the guise of acceptable outer clothing. Given all of this, it can be significant progress to take a few exploratory steps together, each of which re-builds trust, collective insight, generates small signs of progress and a willingness to carry on. 6. Learn to pay attention to the whole of your experience. The days when we could rely on just our cognitive analytical intelligence are long gone; this is only the ‘entry stake’, to borrow a casino term. We need to develop and draw on our multiple intelligences – cognitive, emotional, spiritual, intuitive, aesthetic, moral – if we are to sense and navigate well in this VUCA world. Secondly, the intensity of VUCA stuff will trigger us into reactive, unskilful responses unless we discover our hot buttons, the ones that rapidly set us off into dysfunctional behaviours. Responding mindfully is no longer a ‘nice to have’ competence. Mindfulness, in the sense I am using it, creates alertness, flexibility, curiosity, courage and compassion to be and do what is needed in any given situation. Thirdly, our experience is potentially a clue to the state of the system and our relationship to it, for example our sense of feeling burdened and alone with this issue may be a clue that we have sucked up responsibility and isolated ourselves from others. This awareness gives us choice. 7. Create conditions that support authentic, courageous and compassionate speaking and listening. It is amazing how much of our talking and listening is not this. And how fresh it feels, and rare it is, when there is a genuine exploratory and inquiry quality to our speaking and listening. There are simple and powerful conditions (practices and structures) for more effective talking and listening that we can co-create in small and large groups. These make an enormous difference and have the best chance of illuminating the personal and the systemic dimensions of the conflicted situation. What is shocking is how often these conditions are absent with disastrous consequences for our human systems. 8. Discover the key patterns that are debilitating your system and those that are healthy and productive. 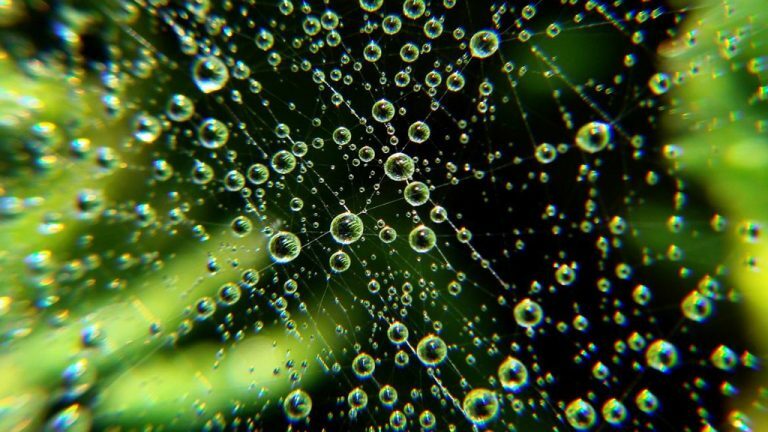 I have found the work of Barry Oshry to have a depth, rigour and practicality in understanding the predictable dysfunctional patterns that human systems regularly fall into as well as those that restore personal and organisational health and vitality. Oshry’s work and research over the last 40 plus years highlights the core processes that sustain or undermine any human system. There are literally thousands of systems models and approaches out there. It’s a fool’s errand to try and master them all. What is useful is to know a few deeply enough to help you dynamically steer in this complex world. Oshry’s systemic perspective corrects the erroneous belief that our problems are primarily personal, that if we were to fix or change the individuals, our problems would go away. Patterns often persist even when you change the players. What is so often missed is the importance of context in shaping our experience: the experience of ourselves, how we see and feel about others, and the relationships playing out between us. Learning to see, understand and master the (systemic) contexts we and others are in, gives us a better chance of surviving, adapting and thriving in this turbulent world. 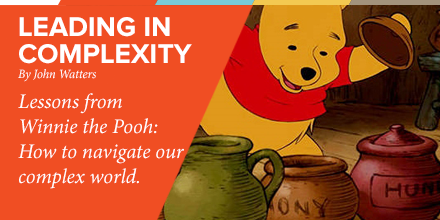 What can Winnie the Pooh teach us about navigating complexity? Writing about the VUCA world reminds me of the Winnie the Pooh film and the scene where Rabbit, Pooh and Piglet are lost in the mist in the 100 Acre Wood. Over-confident Rabbit is sure he knows how to navigate in the mist, but his strategy serves only to bring them round in circles back to the sandpit. Rabbit refuses to examine his tactics or his assumptions and in fact strides off on his own to show Pooh and Piglet he knows what he is doing. Rabbit ends up lost and bewildered, on his own, his mind playing tricks on him. In contrast, Pooh knows that he is lost and admits he doesn’t know the way home. Authenticity breaks through for the first time after Rabbit’s bluster. Now Rabbit has stopped talking, Pooh can listen to the 12 pots of honey in his cupboard calling him home. Future Considerations leads public programmes with the aim of exploring different topics including organisational systems and complexity. One popular workshop is Barry Oshry’s Organisation Workshop. John Watters is an Associate of Future Considerations and the leading authority in Europe on Barry Oshry’s systems leadership work. He has worked in partnership with Barry Oshry for over 15 years and is a Senior Associate of Power+Systems. He specialises in working with complex challenges that involve multiple stakeholders; creating the conditions for fundamental shifts in performance and realising personal and organisational purpose. There’s a specificity to the qualities and skills she sets out here which is so helpful. I think this ‘currciula’ isn’t widely appreciated. Let’s just take one example to illustrate from her list: ‘exercising power without aggression’. Can we cultivate a greater range in how we exercise power and how we respond to other’s use of power: for example the power of charm, expert power, logistical power, the power that is mutual and willing to inquire and adapt in the moment. And our challenge is to find the balance between wholehearted engagement in the messy, perplexing beauty of our work and the world and as we can, find a moment to pause, renew and reflect. John: There are two things in this wonderful piece that really struck me: 1) the need to enhance cognitive skills with the rest of our capacities; and 2) the magical role authenticity can play in enabling both our hearing and our listening. Every time I do or participate in an Oshry session, I learn something about myself and how I am within a system. It seems to be a set of lessons that benefit me again and again. Hoping your upcoming programs bring light into many lives. Beth, you noted ‘the magical role authenticity can play in enabling our hearing and listening’: authenticity has a quality of openness to the uncertainty of the situation. I am slowly learning about the possibilities of Uncertainty, the ‘U’ in VUCA. Uncertainty often gets a bad press and many of us spend enormous amounts of individual and collective energy reducing uncertainty. And sometimes we need to do that. And yet uncertainty introduces novelty, the opportunity for new possibilities to break through and is the creative potential of evolution. Martin McGuiness, former deputy first minister in Northern Ireland, died today and many would have said in previous decades that the polarisation and hatred between the different sides in Northern Ireland was intractable. And yet in the messiness and uncertainty of the long negotiations, with much at stake for all sides, a more peaceful way of living together did break through in Northern Ireland. Thank you – I love Agnes de Mille’s quote… and I have a sense that uncertainty like stickiness and struggle is (to steal a word from Brene Brown) the birthplace of possibility and new shoots. “Whats the good of that?” said Rabbit. John – thanks for this typically thoughtful piece. I have over recent years come to value two things in particular: (1) the cultivation of the “pause”, that moment when we can choose to interrupt our habitual responses and open up a possibility, for ourselves and others, of another way, another route, another conversation; (2) the power of listening, truly listening (at levels 3 and 4 (empathetic and generative) in Otto Scharmer’s “Levels of Listening”) in order to begin to see beyond our own limited view and to tip toe (at least) into another’s world. These along with many of the invaluable (essential as you say) practices in Mindfulness provide an entry point into new beginnings, a portal into new possibilities. If these can then be coupled with a prototyping mindset, an experimental approach where, like Pooh, we acknowledge we don’t know but are willing to “fail fast” in order to discover new ways of responding and connecting to self, others and the wider world, then we have a chance of breaking free of our current chains of habit. I know those who attend your workshops will get an encouraging nudge (maybe even a kindly push) along this new path. Thanks Tim. Three further thoughts triggered by your post. 1)	I was reading outside of the organisation/leadership literature this last weekend and I was struck by the phrase “no hay camino”: there is no path. I find this funny at one level, as you and I have walked parts of the famous Santiago De Compostela Camino in Spain together, and there is a path. Although even on this established path, it is surprisingly easy to lose your way if you are not paying attention and don’t follow the signs, which are not always clear. The analogy for organisational (and maybe for societal) work is there are things to look out (signs) and sometimes well-worn paths worth following. And, in the complexity of many situations, we have to figure out how best to proceed together and there are no established paths as, in some real sense, we are breaking new ground, and we have to listen deeply within, to each other, and to the emerging signs of what’s possible in the unfolding context in which we find ourselves. 2)	I was on a Zen retreat recently and I heard the Zen path of meditation described as a ‘path of intimacy’: cultivating intimacy with oneself, with the other and with the world. This may sound ethereal and abstract to some, but in fact it is practically related to growing our capacity to deeply listen. I noticed my reaction as I heard this, seated on my meditation cushion, was one of terror, wonder and possibility. Why the terror? Perhaps because when we don’t listen we feel we are sealed (and protected?) in our little bubble, seemingly safe but also somewhat isolated from the other and the world. I am discovering how to pay more attention to my whole self in my experiments (aka living). This is where the idea of multiple intelligences (or lines of development to use the technical term) is helpful as we have many ways of paying attention to very different kinds of data (imaginative, rational, emotional practical, aesthetic, spiritual, mathematical, moral…). Historically I privileged rational data and it’s something new for me to widen what I pay attention to, day to day. Mmm! I think I hear the sound of honey calling…Onwards…Home… or maybe back to the Pit…? A lovely article John. VUCA conditions present a gift to us all – the chance to see the background of practices we live in, to see that they do not respond well to all circumstances, and the opportunity to design new practices. The move from Rabbit’s frantic activity to Pooh’s listening, is an archetypal shift in practices, and one badly needed in much of the world today. Pete, How interesting to think of VUCA conditions as a gift! Your comment makes me think about the power of framing. I was at a rather chaotic church event yesterday, until somebody described it as a ‘holy mess’ where creativity could break through. That switch of frame from ‘chaotic, disorganised mess’ to ‘holy mess’ gave me a whole different set of feelings and thoughts about the same situation. Thanks, John (reposting the comments I initially made on your LinkedIn share of this blog). When I first saw your post, I wondered what Winnie the Pooh had to do with learning to be with the deep and challenging situations we can find ourselves in life during these times. But if I am fairly summarizing the main lessons from that concluding story as 1) First admit what you don’t know 2) Be open to your own unique intuition for the next step, then I would say that this really is essential wisdom on facing uncertainty in a way that helps, perhaps the only way that does. What’s also powerful about this, is that it brings a resonance to the surface for me of all the times I DON’T do this (particularly step 1, without which step 2 is pretty hard to access), or in fact do the complete opposite. I hope I can keep unlearning/undoing that reflex of bravado that I so successfully trained myself in from a young age, and only became aware of later as an adult when it was quite deeply ingrained. Your reflections (in particular around deciding if the situation is a battle or a space to learn) also made me think of talks and instruction I’m giving around meditation at the moment, where the principal guidance for facing a difficult experience is to see if we can STAY with it, rather than reach for pleasure/relief or react with aggression. Again learning (and sharing) this guidance makes me all the more aware of the times when I feel I’m NOT able to do this in heightened moments of challenge. But perhaps that’s the function of wise instruction, not – as it might seem – to create an expectation that we must get it right all the time, but a reminder, an orientation point (navigation?) in our journey that can help – at times by contrast – nurture the development of our awareness. 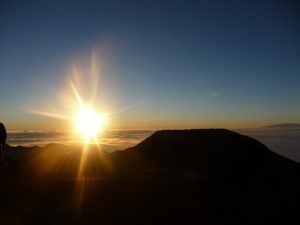 And from the meditation point-of-view, the instruction above is not given without some fundamental advice on how we might to do this – we are encouraged to access our warm, vibrant, gentleness as human beings to be kind enough to ourselves to stay with whatever is happening without escape. I think Pooh would approve. Ali, Your comments remind me that we are not alone in complex situations and we can draw on other’s contributions, perspectives and contributions. Even if, as in Winnie the Pooh story, those others seem on first glance a motley group of oddball characters. After all, it’s Tigger, who earlier in the story was seen as a problem, that finds and ‘rescues’ Rabbit. Thanks for raising mindfulness again. It’s helpful to crystallise where I stand, as so many people are talking about mindfulness and often meaning very different things: combining compassion AND insight is vital. When I see the world with a compassionate eye it looks very different than when I look with a cold, clinical eye. Compassion is essential but not sufficient, otherwise we fall foul of Martin Luther King Jr’s observation about love without power, as being sentimental and anaemic. Insight, which includes the insight of others, has to be coupled with compassion. Insight reveals the structure of the situation, the various forces and elements at play, and helps inform wise action. This is why over the years I’ve stayed with Barry Oshry’s work as it combines these two elements of compassionate seeing and personal and systems (in)sight. And Oshry’s work reminds us that much of the time we are neither wise nor compassionate but rather myopic and self-oriented. This is perhaps why humility is such an important factor in leadership and day-to-day life: eating our portion of humble pie is good for the soul but not always the first dish we reach for. The power of habits and our reflex, habituated responses are often grossly under-estimated. This writing and reflection can make it seem clearer or easier than it actually is in the messiness of everyday life. The ever-present danger is that is so easy to slip into over-confident ‘Rabbit’ mode. 1. individual level: helping people see their agency, power and accountability wherever they are in the system and commit to next steps. There are many ways to sustain this as you know: action learning, individual and team coaching, communities of practice.,. 2. cultural: many consultants and leaders underestimate the collective field of beliefs, myths (stories), identity and rituals. I also want to attend to how culture is embodied and made tangible in processes, procedures, espoused and enacted values. How are these constraining and enabling what needs to emerge? Some organisations have swung too far to an individual focus and forget how sensitive we are as human beings to cultural norms. I always remember Marv Weisbord’s comment that he was always amazed that if you shifted the environmental conditions (culture embodied in organisational mechanisms such as processes, rewards, procedures) ‘people straighten up and fly right’ without any particular shift in their individual capability or action logic. Thanks for this John, very helpful. Let’s do a phone call to discuss.